This entry is part 6 of 9 in the series CheeseWeb Tastes Cheese. While CheeseWeb has never been a website about cheese, every now and then we like to throw a bit of cheesy-goodness into the mix. Andrew jokingly refers to me as ‘the Big Cheese’ and it’s no secret I would rather have an excellent cheese board than any sweet dessert in the world. So when it came to planning our time in Normandy, while Andrew was mapping out D-day Beaches and memorial sites, I was dreaming of cheese. Of course, my entire France agenda is filled with cheesy stops. Cheese farms are on my list of requests when we contact the regional tourist boards. But while just about every region of France is famous for one cheese or another, there is one name synonymous with French cheese the world over – Camembert – and I had to visit it. Now Camembert isn’t my favourite French cheese. It probably doesn’t even crack my top ten. But there’s no denying the reputation of Camembert among the world’s best cheeses. And, because we would be passing close by anyway, I wanted to at least make a little detour to the village famous for French cheese. The night before our visit to Camembert, we camped in the nearby town of Vimoutiers and this is where my cheesy tale actually begins. Why is the cheese in Normandy so good? Happy cows of course! As we’ve been travelling through France in our motorhome, we’ve frequently been relying on an organisation called France Passion to find places to stay. France Passion allows farmers to offer space on their farms for motorhomes to park overnight. The motorhomes can park for free, with the hope they will buy something from the farm. It’s win-win for the campers and the farmers and a great way to find off the beaten path camping spots, friendly locals, and great regional products – in all, everything we love about travel in one simple package. Our camping spot in Vimoutiers was on the Ferme de la Croix Blanche, owned by Marie-Christine and Régis Liard. We arrived on a Sunday afternoon and all was quiet on the farm. Our camping spot had a lovely view over the valley, dotted with happy cows grazing under apple trees. No wonder the cheese here is so good. 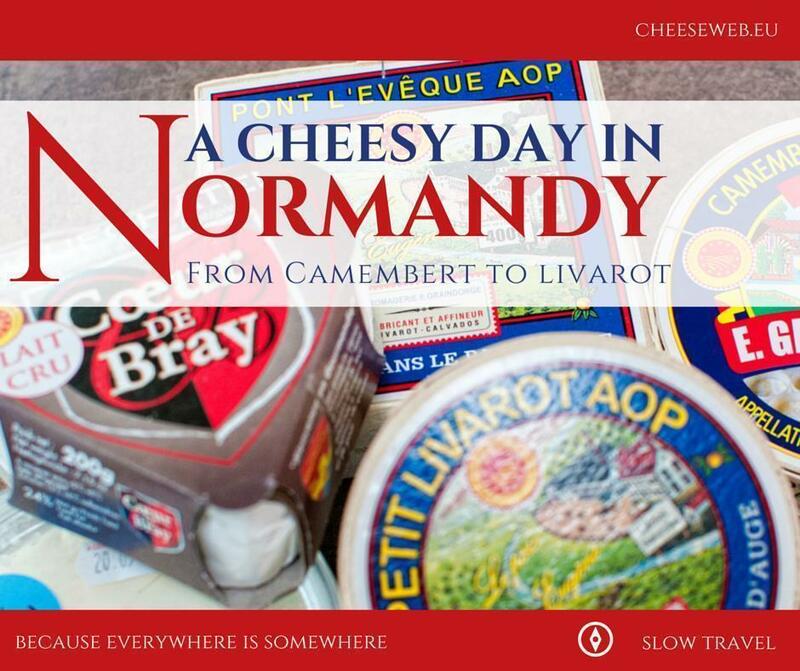 Wanting to know what we should do in Camembert the next day, I turned to the internet. Sure enough, there is a cheese museum in the village. But when I dug a little deeper, I learned it is owned by one of the large, industrial cheese companies. Reviews on Trip Advisor were a mixed bag, with a number of people complaining about the entrance fee to the museum and the fact there wasn’t even a cheese tasting offered. Several people mentioned finding the cheese museum in Livarot much more enjoyable. I added it to our to-do list for the following day. Before we left the farm the following morning, we passed by the farm shop. Marie-Christine greeted us and told us a bit about the farm. 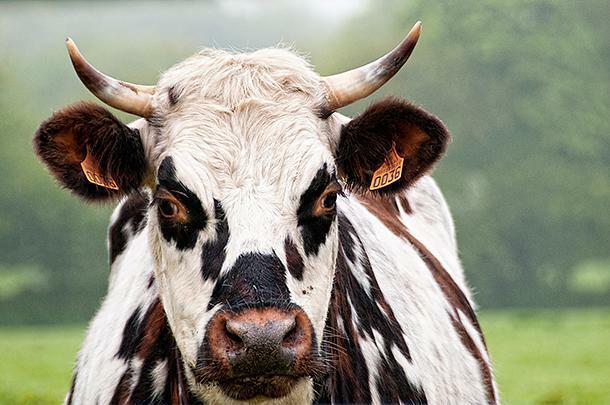 They have 65 cows that produce milk, which is mainly sold to the E. Graindorge cheese maker in Livarot – the very one I planned to visit later in the day. We bought some juice, eggs, and a Camembert before leaving the farm and heading on to more cheesy adventures. 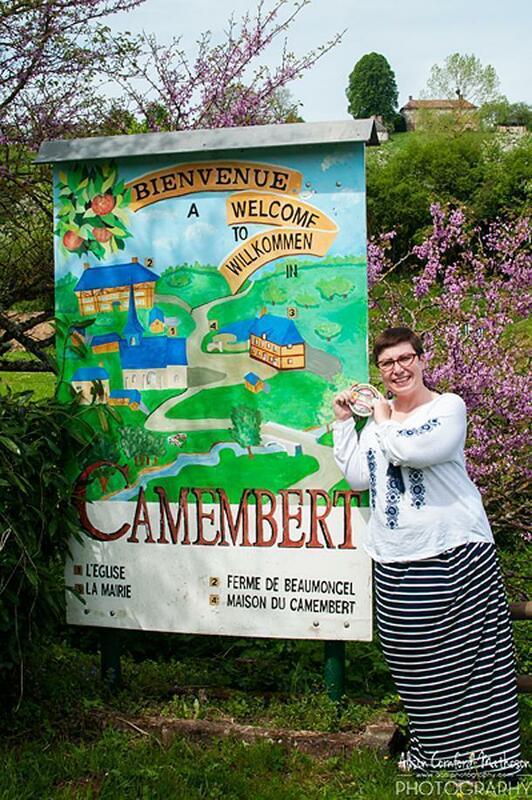 I still wanted to see Camembert for myself and take the requisite cheesy photo by the village sign. Mission accomplished. Our visit to Camembert lasted under ten minutes. The village is tiny. In addition to the cheese museum, there is a town hall, a tourist office, a church and maybe a half-dozen houses. We carried on to Livarot where we found the E. Graindorge Fromagerie on the outskirts of the town. 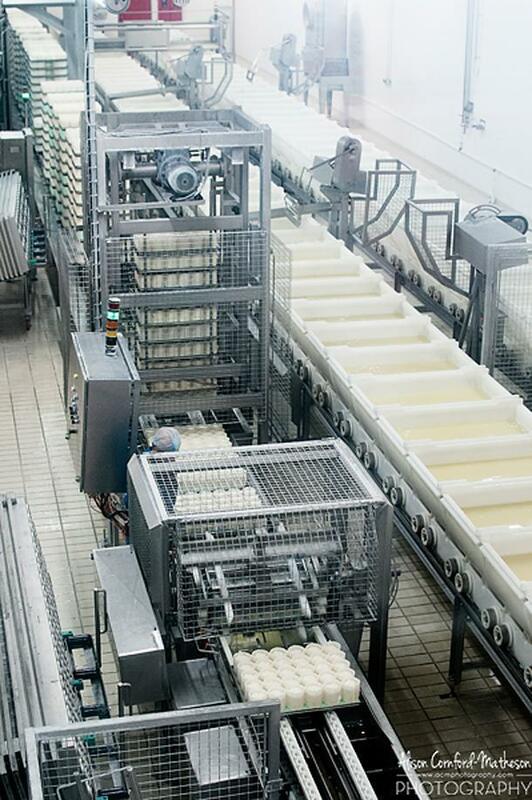 This has been a family operation for three generations, since its beginnings in 1910. 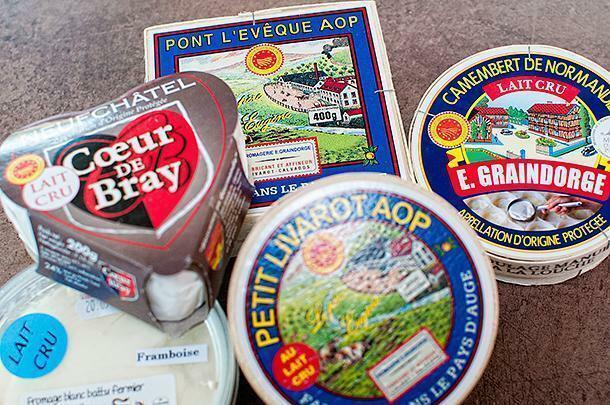 The fromagerie produces all four of Normandy’s AOP cheeses: Pont L’ Évêque, Neufchâtel, Livarot, and the Camembert de Normandie. The Graindorge museum and factory is free to visit and is well presented in multiple languages. 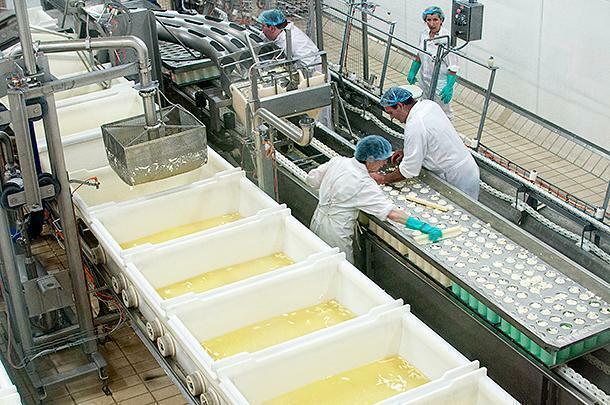 In addition to films (in French but subtitled in English) about the cheese-making process, you actually get to see much of the factory itself, from behind viewing windows. For someone as cheese-obsessed as me, it was fascinating to watch. 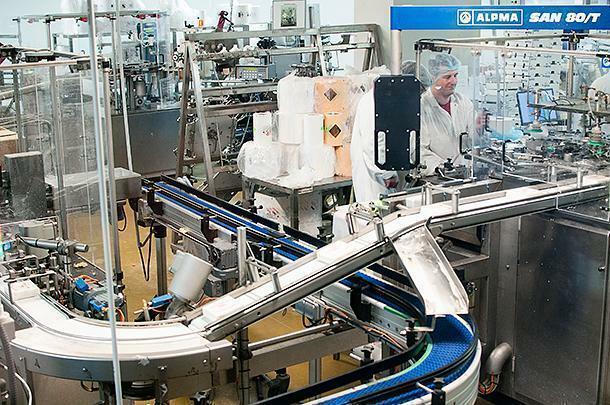 Much of the process is automated, but still, all of the important parts are done by the hands of talented cheese-makers. 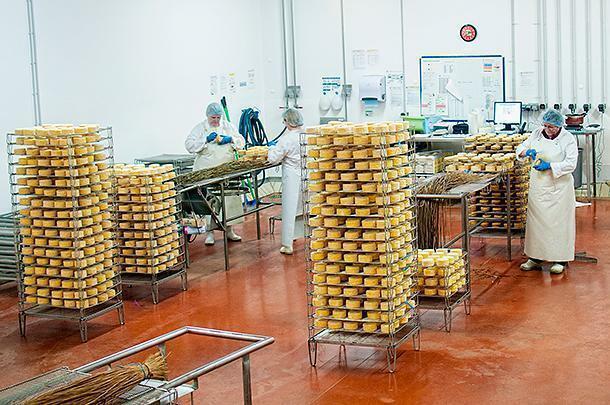 For the Livarot cheese, in particular, there is one room dedicated to hand-tying the bullrush reeds around the cheese, just as it has always been done. At the end of the visit, is the shop – a glorious shop filled with cheese (and other regional products too – but really, it’s all about the cheese). In the shop, you are encouraged to sample one of each type of cheese. 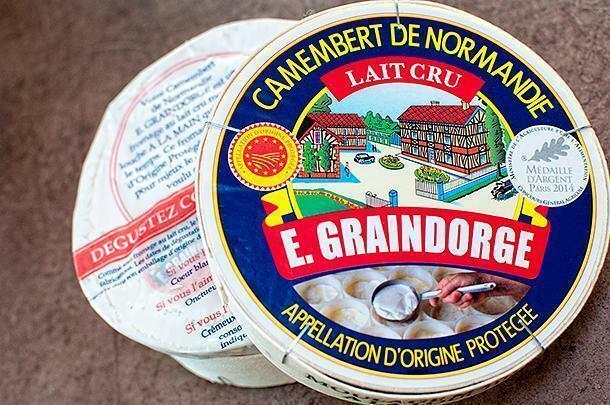 If you’re anything like us, tasting encourages buying – so we walked away with the 3 other cheeses produced by E. Graindorge, to join the Camembert waiting in our fridge. We also couldn’t resist a fresh cheese with raspberries to have with our breakfast. 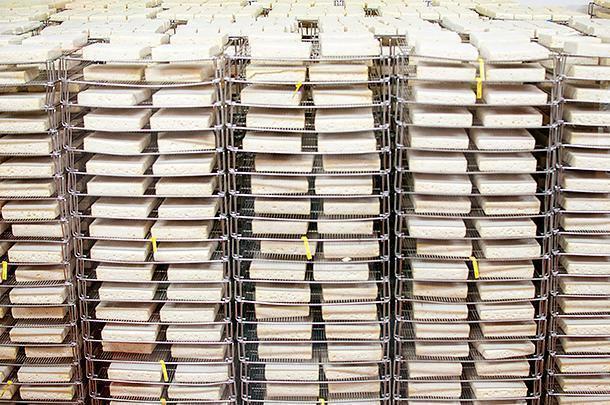 We may have bought a few cheeses… for research of course. 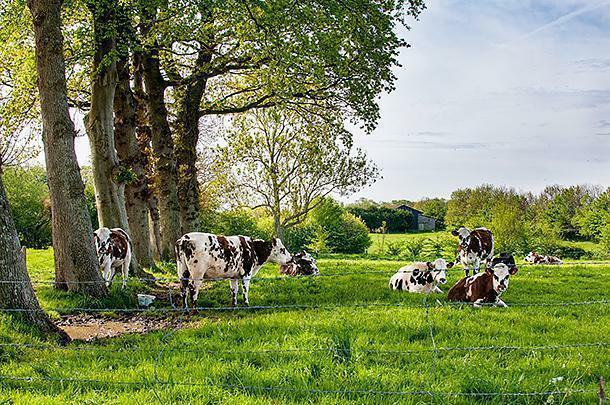 With fields and fields of speckled Normandy cows, lazily munching plants under the cider-giving apple trees, it’s not hard to see why the region produces excellent cheeses. And while the village of Camembert itself may not take much time to visit; there are plenty of local, cheesy adventures to be had in the area.